The Aspirus Cancer Registry participates in statewide and national programs to improve the quality of cancer detection and care. Aspirus maintains a Cancer Registry, as required by state law, which tracks causes, diagnosis and treatment of cancer and blood disorders. Information about each new patient diagnosed at any Aspirus hospital is sent to the Wisconsin Cancer Registry as well as the National Cancer Database, where it is combined with data from all other cancer patients and studied to find ways of improving cancer care. The Aspirus Cancer Registry currently has information on more than 14,000 patients diagnosed and/or treated for cancer since 1988. All patient information collected by the Aspirus Cancer Registry is kept confidential, in accordance with Wisconsin Law HFS 124.14 and established hospital and Wisconsin Cancer Registry policies. The information is only used collectively to aid research to improve the detection and treatment of cancer now and in the future. Aspirus Wausau Hospital Cancer Registry records are regularly updated with information about the patient's current health status, treating physician and date of last physical examination. To capture all data for each type of cancer, patients are tracked for life. Follow-up with the patient's physician. Contact with the patient or patient's family, if the physician is unknown. This statute describes how cancer cases must be reported to the state. All reporting facilities must (a) use a prescribed form to submit the cancer report, (b) follow a certain time schedule when submitting the report, and (c) report specific types of cancer and precancerous conditions. The statute also requires that any information gathered remain confidential. For more information, please visit www.legis.state.wi.us/rsb/statutes.html. The Wisconsin Cancer Registry in considered a public health entity, which means Aspirus may continue to report cancer patient information ­ confidentially - without violating HIPAA, an act designed to protect sensitive medical information. To earn voluntary accreditation, a cancer program must meet or exceed numerous Commission on Cancer quality standards, be evaluated every three years through a survey process, and maintain levels of excellence in the delivery of comprehensive patient-centered care. The Commission on Cancer accreditation program provides the framework for Aspirus Regional Cancer Center to improve its quality of patient care. 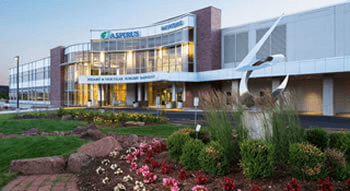 Aspirus Wausau Hospital's cancer program meets these criteria and has been accredited by the Commission on Cancer since 1978.